Long sleeve shirts for work or casual in a wide choice of styles, sizes, and colors. Big and tall sizes up to 6XL. Dickies long sleeve work twill shirts match their basic work pants. 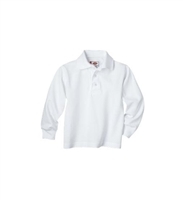 Other Dickies long sleeve styles include denim or chambray work shirts, and long sleeve polo and pocket tee shirts. Carhartt long sleeve shirt offerings include their long sleeve pocket tees, Henleys, and plaid work shirts in a wide range of sizes and colors. Carhartt denim and chambray work shirts are made with legendary Carhartt quality. Wrangler and Riggs long sleeve shirts include their traditional Rugged Wear denim and chambray shirts. Riggs long sleeve twill work shirts, henleys, and pocket tees all offer comfort and durability.